As we keep reminding people, it’s very important you store your WordPress backups on remote storage (like Dropbox) to protect against the many server-wide risks. Some other backup plugins don’t have this essential feature or make it a premium feature – but we’ve always believed it’s so important we’d make it free at the start. But sometimes, perhaps you’ve run out of remote storage temporarily, or when you’re developing locally with a poor internet connection it’s more convenient to do a local backup. If you then change your mind and want to upload this backup to remote storage later, you’d have to do this manually. But no longer with this new feature. So you can now upload local backups that are complete (no backup parts missing e.g all the zip files that were originally created when the backup was taken are still present) and that have not been uploaded to remote storage before e.g you didn’t download your backup from Dropbox and then try to upload it again (because it’s already there!). At UpdraftPlus we’re continuously making incremental improvements like this to maintain our position as the most trusted backup plugin. The post New feature: upload existing local backups to remote storage appeared first on UpdraftPlus. UpdraftPlus – Backup, restore and migration plugin for WordPress. New product names. New pricing (for 35+ sites). New features. Today we changed our UpdraftPlus Premium product names and pricing for over 35 sites. The Personal and Business names remain unchanged. Enterprise is now $245. The reason for the increase in price for those over 35 sites is to fund our growing team of developers to code some very cool features, which will particularly benefit those with many sites. Thanks for all your support and custom! The post New product names. New pricing (for 35+ sites). New features. appeared first on UpdraftPlus. UpdraftPlus – Backup, restore and migration plugin for WordPress. WordPress has developed a new editing experience, which it humbly named Gutenberg, “after another invention that revolutionized publishing.” According to its website, Gutenberg will make a big difference to how everyone– users, developers and hosts- interacts with WordPress. 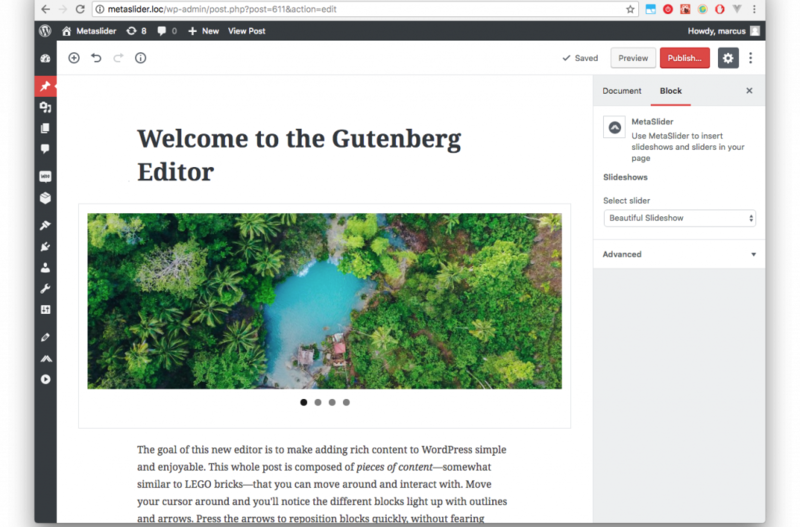 The Gutenberg editor makes rich website-building even simpler and more intuitive so that just about anyone can publish content, regardless of whether they have any technical knowledge or can even write code. Instead of different, inconsistent ways of creating custom content, Gutenberg uses various types of content blocks (e.g. text, videos, images, quotes, etc). Users can add blocks individually, filling each one with content as they go along and then positioning them in exactly the right position, rather than creating all content in one big editorial field. Creating content this way makes it much easier to tell as you’re going along how content in the front-end will look. Gutenberg will be much more in line with modern coding standards and aligned with open web initiatives. Development is still underway, and there’s a fair bit of concern in over the inevitable difficulties involved with the entire WordPress community getting used to such a massive change. However, disruptive innovation is necessary if technologies don’t want to be left behind. 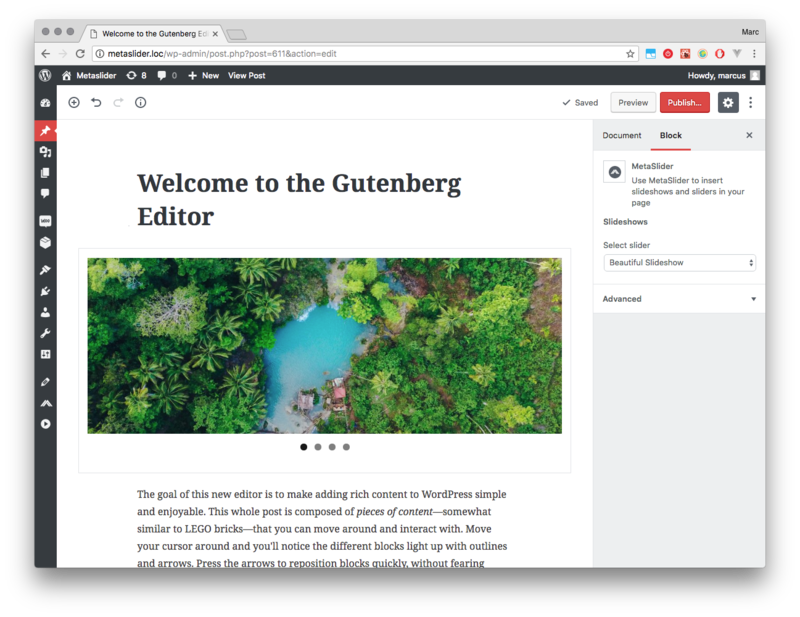 The bottom line is that soon, Gutenberg will become a part of the WordPress core, replacing TinyMCE as the default content editor on every up-to-date WordPress website. If all goes to plan, it will be a revolutionary innovation that will change everything about website-building for the better. How is UpdraftPlus adapting our plugins? We at UpdraftPlus couldn’t ignore Gutenberg for our MetaSlider slideshow plugin. Whilst most of our plugins are backend, MetaSlider affects the front end so needs adapting. So we’re currently working hard to ensure that Metaslider is entirely compatible, working with blocks that you can easily drag and drop anywhere on the page. Pretty cool, eh? The post Gutenberg: why it’s your friend and how we’re getting ready appeared first on UpdraftPlus. UpdraftPlus – Backup, restore and migration plugin for WordPress. Do you manage lots of WordPress sites? Our UpdraftCentral Dashboard has loads of features; for most of our users, it’s an ideal way of controlling all your WordPress installs, backups and updates from one dashboard. But we recognise that some of our advanced users and coders like to use WP CLI.The command-line interface (CLI) has always been popular in the world of developers because it provides tools that boost productivity and speed up the development process For those who don’t know, CLI stands for Command-Line Interface. It enables users to carry out all kinds of actions you might perform in the WordPress Admin (or UpdraftCentral)-for example, updating plugins and configuring multiple installs- but without using a web browser. We’ve now made it possible for you to control UpdraftPlus Premium through WP CLI. This is something many of our professional technical customers will find handy, as although it doesn’t have a nice-looking graphical user interface, it makes it quicker to perform complex and lengthy coding, thus boosting productivity and speeding up development. Please go here for more information on how to set it up. The post WP-CLI for UpdraftPlus: backup from the WordPress command line appeared first on UpdraftPlus. UpdraftPlus – Backup, restore and migration plugin for WordPress.